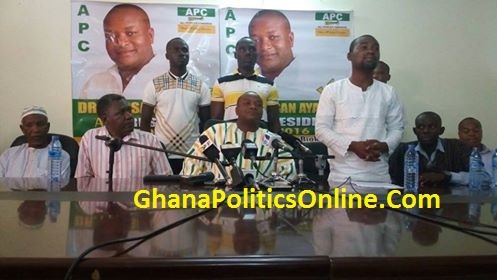 Speaking at a press conference which was organised by the APC, Dr. Hassan Ayariga said that now “The Storm is over” and the question on the lips of sceptics as to whether he Dr. Hassan Ayariga could form and lead a Political Party now belong to History. According to him the purpose of the gathering was to praise his loyal followers and deliberate on the way forward for the party. “As a first step, we are seriously building our Party and preparing it in readiness for Congress in all the constituencies nationwide. As I speak now, Constituency elections have already begun since Monday 25th April and will end on Saturday the 7th May 2016. Regional Elections will follow immediately from Monday 9th to Saturday 14th May; that will culminate with our National Delegates Congress in Kumasi on Saturday 28th May 2016, where all out National Officers including our Presidential Candidate will be elected. All elections will be supervised by Officers from the Electoral Commission of Ghana. Nominations for Parliamentary Candidates will be opened on the 6th June 2016. However the date for the launch of our Party’s Manifesto will be announced in due course” Dr Hassan Ayariga hinted. Talking about the ” Come on Board Tour” yet to be embarked on in all 10 regions, he said that he will start in Volta Region. In a separate chat with GhanaPoliticsonline.com, he added that “Somebody may ask why the need for a “Come on Board Tour”? As the saying goes seeing is believing. Seeing the APC being led by its young Leader sends a clear message to the youth that can do attitude is real and possible.